Draft: 2008, Cleveland Indians, 1st rd. Lonnie David Chisenhall...Wife's name is Meredith…Has two sons; Cutter (7) and Cannon (4), and one daughter; Loftin (1)...Is a 2006 graduate of West Carteret High School in Morehead, NC...Batted .574 his senior year with nine home runs and 37 RBI...Was named the 2006 Louisville Slugger/BCA North Carolina Player-of-the-Year...Earned 2006 Baseball America second-team High School All-American honors and was a two-time North Carolina 3A all-state selection (2005-06)...Spent the 2008 school year at Pitt Junior College in Greenville, NC, where he hit .410 (68-for-166) with 27 doubles, eight homers and 66 RBI....Named a NJCAA All-District and First Team All-Region X All-Conference selection...Played his freshman season for the University of South Carolina in 2007 (20 games, .313, 1 HR, 13 RBI) before enrolling at Pitt J.C. for the 2008 season...He and his wife were frequent visitors of the Providence House in Cleveland, the nation's oldest Crisis Nursery, committed to child abuse prevention and family preservation...Through "Lonnie's Line Up" - Lonnie and Meredith hosted families from the Salvation Army for select home games...In addition, Lonnie and Meredith are active in the American Heart Association, raising both awareness and funds for heart disease research. Made a total of 28 appearances (24 starts) in right field with Cleveland...Was the Opening Day starter in right field on 3/29 at Seattle and went 1-for-3 with a double; also swiped his lone base of the season (20th career)...Appeared in seven games with the Indians in April (4-for-17 with a double) before suffering a right calf strain on 4/7 vs. Kansas City...Was placed on the 10-day disabled list on 4/8 and missed the next 50 big league games...Hit .286 (8-for-28) with three doubles, two homers and six RBI in nine total rehab games with Triple-A Columbus and Double-A Akron between 5/21 and 6/4...Was reinstated from the D.L. on 6/5 and hit a combined .343 (23-for-67) in June/July with five doubles, a homer and nine RBI in 22 games...Hit his lone home run on 6/27 at St. Louis...Played in final game on 7/1 at Oakland as he suffered a left calf strain during pregame warm-ups the following night in Kansas City...Was placed on the 10-day D.L. on 7/3; was transferred to 60-day D.L. on 7/20...Rehabbed most of July and August in Cleveland before transitioning his rehab to Goodyear, AZ, spending the last five weeks in Arizona...Was removed from 60-day D.L. on 10/29 and declared free agency...Was signed by Pittsburgh as a free agent on 11/27. Enjoyed his most productive offensive season around three stints on the disabled list, compiling a .881 OPS for the year, which was the 16th-highest mark in the American League among batters with at least 250 plate appearances...Started the year on the 10-day D.L. after colliding with the outfield wall in an exhibition game on March 24 at Chicago-NL (right shoulder sprain)...Activated from the D.L. on April 13 after rehab stints in AA Akron and AAA Columbus...Was on the 7-day concussion D.L. from May 23-June 5. Suffered a right calf strain in the final game of the first half, July 9 vs. Detroit, and missed nearly two months of the second half before being activated on Sept. 1 after a 3-game rehab stint between Akron and Columbus. On the year he made 33 starts in right field (45 games), 19 starts in center field, 8 starts in left field (11 games), his first career appearances in left...Also appeared in 7 games at first base...30 of his 68 hits went for extra bases...From June 15 thru the end of the first half he batted .358 (29/81) with 5 2B, 5HR, 27 RBI (25 games) and was leading the team with 51 RBI at the time of his calf injury…Enjoyed his third career multi-homer game, June 17 at Minnesota (night)...Hit his 2nd career grand slam and 3rd career pinch-hit home run on April 14 vs. Detroit (Francisco Rodriguez)...His 5 RBI as a substitute on June 15 vs. the LA Dodgers were the most by an Indians batter since 1973...Was 4-for-17 as a pinch-hitter with 2 homers and 9 RBI, both A.L.-highs (Aaron Hicks also had 2 PH HR). Batted .325 (38/117) with runners on base, tops on the club...Between May 14-June 19 he batted .328 (20/61) with 5 2B, 8 HR & 23 RBI in 20 games...After being activated from the D.L., batted .224 (11/49) in September with 4 2B, 0 HR and 2 RBI over the final 18 games of the season...Missed 10 games, Sept. 15-26, with more soreness in the calf after leaving Sept. 14 contest vs. KC...Batted .343 (23/67) when pitcher was behind in the count (1.238 OPS)... Had an OBP of .456 (57 PAs) versus LHP this season (League Avg: .326)...OPS of 1.040 (147 PAs) versus starting pitchers this season (Rank: 1st of 176 part-time hitters in MLB; League Avg: .766). Season got off to a slow start but became a solid contributor against right-handed pitching as the season progressed ...Started the year on the 15-day Disabled List after being limited to just 10 spring games (did not play from March 15- 23) due to right forearm and left wrist soreness...Was his second stint on the DL at the Major League level...Rehabbed between AA Akron and AAA Columbus before being activated off the DL on April 20...Over his first 23 Major League games he batted .232 (16-69) with 4 2B, 1 3B, 0HR, 4 RBI thru May 22...From May 23 thru the end of the season he batted .297 (94-316) with 21 2B, 4 3B, 8 HR, 53 RBI and 33 runs scored in 101 games to end the season...Overall on the year he made 99 starts (118 games) in right field and his first career appearances in center field (2 games/1 start)...Also appeared in 3 games at first base and 1 game at third base during several lopsided contests... Had three games of at least four hits over a 9-game span from June 26-July 5, including his third career 5-hit game on July 1 at Toronto (19.0IP)...Now was six career games of at least four hits...Went 4-for-4 w/a 3B, HR and 3 RBI on June 26 at Detroit...From June 21 thru the end of the season he batted .296 (72-243) in 77 games... Hit .270 (47-174) in the second half with 14 2B, 1 3B, 2 HR & 29 RBI in 60 games...Ranked 17th in the A.L. in batting average with runners on base (.312, 53/170) and tied for 10th in triples (5)...Excelled at home, batting .309 (56-181) in 62 games in Progressive Field with a .355 OB and a .814 OPS...Had only 51 plate appearances vs. LHP...Hit .486 (18-for-37) on 0-0 counts this season.. OBP of .407 when leading off an inning in the second half of the season (League Avg: .323). During his stint in Columbus he batted .280 (44-157) with 13 2B, 3 homers and 21 RBI in 40 games from June 10-July 29...He appeared in 32 games at third base and 4 games in right field at Triple-A and batted .306 (34-111) with 12 2B, 2HR and an .824 OPS off right-handed pitchers before being recalled on July 30 when Brandon Moss was traded to St. Louis. Spent his first full-season in the big leagues at age 25, spending most of the year at the hot corner while establishing new career-bests in virtually every offensive category....Finished among American League batting leaders in batting average (23rd, .280)...His .770 OPS was higher than other third base regulars from around MLB (Aramis Ramirez, Trevor Plouffe, Matt Carp enter, Pablo Sandoval, Evan Longoria, Casey McGehee, Chase Headley, David Wright). Enjoyed a career game on June 9 at Texas, becoming the fourth Major League player with 5 hits, 3 home runs and 9 RBI in a single-game, joining Fred Lynn (1975), Gil Hodges (1950) and Walker Cooper (1949)...Was his first career 3-homer game and his second career multi-homer game...Tied the 114-year old franchise record for single-game RBI (2nd tmie, Chris James, 1991) and was his second 5-hit game of his season/career (other was May 14 at Toronto) ... Also had a 4-hit game on April 17 at Detroit..Hit in a career-best 9 straight games from June 2-11. Hit .362 (17-47) in 17 April games as he bounced between DH/third base and a pinch-hitting role before catching fire in May, hitting .373 (31-83) with 9 2B, 3HR and 14 RBI in 26 games...Hit .311 (28-90) in June with 5 2B, 5HR and 21 RBI in 24 games...Thru games of June 11 he was hitting .393 (66-168) with 17 2B, 7HR and 32 RBI in his first 53 games of the season ... Did not qualify among American League batting leaders until July 8th and debuted at 3rd in the league in average at the time (.332). On the year he made 108 starts at third base (114 games), 5 starts at first base (11 games) and 14 starts at designated hitter .... Was 6 for 13 with a homer and 4 RBI as a pinch-hitter, hitting his first career pinch-hit home run on May 22 at Baltimore (only P H HR by an Indian in 2014) ... From August 23 thru the end of the season Lonnie hit .267 (31-116) with 6 2B, 2HR and 13 RBI in his final 34 games ... Made starts in every position in the batting order save the lead-off spot. Chisenhall spent most of the season with Cleveland, struggled to find his footing at the Major League level and enjoyed a successful one month stint in AAA Columbus in May and June...Opened the year on the Major League roster and recorded his first opening day start in Toronto on April 2nd...Was in the big leagues from the start of the season until May 12, hitting .213 (20-94) w/4 doubles, 3 homers & 11 RBI in 26 games before being optioned to AAA on May 13...With Columbus he hit .390 (41-105) w/8 doubles, 2 triples, 6 home runs & 26RBI in 27 games for Clippers (1.132OPS)...From May 29 until June 18 recall he hit .467 (28-60) w/8 2B, 2 3B, 2HR & 16 RBI in 16 games and hit in 16-straight games from May 17-June 7...Hit .310 (9-29) off LHP in AAA and .367 (18-49) with runners on base...Recalled for the final time on June 18 and spent the remainder of the season in Cleveland, hitting .231 (45-195, 23 runs) over his second stint with 13 2B, 8HR & 25 RBI in 68 games...Started 83 games at third base on the season (88 overall appearances at third) and recorded a fielding pct of .955 (9E, 198TC) and made just 2 errors over his last 35 games...Endured a tough August, hitting .145 (9-62) with 2HR and 4RBI in 24 games, but connected for his first career pinch-hit home run on August 29 at Atlanta (Carpenter)...Equaled his career-high with 4RBI and hit his first career grand slam on July 13 vs. Kansas City (J Guthrie). Chisenhall split the season between AAA Columbus and Cleveland and spent over two months on the disabled list after suffering a broken arm after a hit by pitch in Baltimore...Started the season at Triple-A Columbus where he hit .324 (36-111) with 12 doubles, 4 home runs and 17 RBI in 28 games (.353OB/.541SLG/ .893OPS) before being recalled on May 28 (Hannahan DL)...Lonnie was on the Minor League DL from April 29 thru May 18 with a strained left calf and would have ranked in the top 10 in OPS, slugging pct and batting average with the requisite number of at bats at the time of his May 28 recall. Homered in his first at bat with Cleveland (May 28 vs KC off Nate Adcock)...Was 11-for-30 over his last 10 games from June 15-29 (.367, 2 2B, HR, 6RBI) before suffering a fractured right ulna on June 29 at Baltimore after being struck by a Troy Patton pitch...Underwent surgery the following day in Cleveland (Dr. Thomas Graham)...Began baseball activities in late August and began rehabs at AAA Columbus and AA Akron on Sept. 2 before being activated from the DL on September 9...Prior to the DL stint he hit .278 (20-72) with 2 2B, 3HR, 9RBI in 24 games (.755OPS). From time of activation thru the end of the season he hit .257 (18-70) w/4 2B, 2HR & 7RBI in 19 games (.725OPS, 7BB)... Over his last 27 games from June 18-end of season he hit .287 (27-94) with 5 2B, 3HR, 13RBI (.807OPS)... With Cleveland he hit .340 (18-53) with runners on base and had an .848OPS vs. RHP (.442OPS vs. LHP)...Made a pair of starts in the clean-up spot late in the campaign...Compiled a fielding pct of .921 (6E, 76TC) in 30 games (28GS) at third base...Also made 8 starts at DH. Split the season between AAA Columbus and Cleveland, spending the last three months of the season at the Major League level for the first time in his career... He entered the 2011 season as the top prospect in the Indians organization according to Baseball America...Began the year at AAA Columbus where he hit .267 (68-255) with 15 doubles, 3 triples, 7 homers and 45 RBI in 66 games (.353OB/.431SLG/.784OPS)...At the time of his June 27th promotion to Cleveland he was tied for 10th in the International League with 45 RBI, 8th in runs scored (45) and hit .309 (38-123) with runners on base and .368 (28-76) with runners in scoring position...Missed 10 days with a concussion (June 12-21) and after his activation from the 7-day DL on June 22 he hit .429 (9-21) with 2HR & 14RBI (.810SLG%) in his last 5 games and was named International League Player of the Week before having his contract purchased on June 27th...Made his Major League debut on June 27 at Arizona and collected his first hit, a double, in the 5th inning off Ian Kennedy....Notched first RBI with a single one inning later...Spent rest of year in Cleveland...Hit first MLB home runoff Boone Logan on July 6 vs. the NY Yankees...5 of his 7HR came off LHP...Hit in the face and missed 3 games vs. Toronto (Carlos Villanueva) on July 7...Overall with Cleveland he made 55 starts at third base (58 games) and reached safely in 45 of 66 games...Recorded a fielding % of .940 (168TC, 10E) which would have ranked 7th in the AL with enough appearances at the position...From August 22nd thru the end of the season he hit .290 (29-100) with 6 2B, 4HR & 15RBI in 29 games and from September 7th-on he hit .315 (23-73) with 3 2B, 4HR & 14RBI in his final 19 games (.854OPS)...Recorded first career 2 homer game (off Mark Buehrle) and career-high 4RBI on September 9th at Chicago-AL...Had a higher average vs. left-handed pitching (.260 to .253) and a higher OPS (.888 vs. LHP, .640 vs. RHP) against southpaws...Hit .345 (20-58) in 16 starts in the 6-hole in the order...Hit .296 (24-81) with runners on base. Put together a very solid season for AA Akron, hitting .278 (128-460) with 22 2B, 17HR, 81 runs scored & 84 RBI in117 games...His 84 RBI were tops in the Indians player development system and his 17HR 7 81 runs were tied for 3rd...Was T7th in the Eastern League in RBI and T9th in runs and 17th in OPS (.801)...He was an Eastern League all-starselection and participated for the USA team in the Futures' Game in Anaheim on July 14 during All-Star Weekend...Was named the 6th best prospect in the Eastern League by Baseball America after the season and enters 2011 asthe top prospect in the organization (also BA) and #2 overall Indians prospect according to Baseball Prospectus...Hit .325 (26-80) in April but was bothered for much of the early part of the season with right shoulder soreness thatlimited his power, driving in just 6 runs over the first 27 games (6 doubles, 0 homers) before going on the DL from May13-27...Slugging % at the time of his DL stint was .315....Upon return the hit .284 (99-349) with 16 2B, 17HR & 78 RBIin 90 games...Hit .294 (57-194) in the second half with 10 2B, 9HR & 47 RBI in 51 games...On the year he hit .310(40-129) with RISP and batted either 2nd or 3rd in all 117 games...Hit a pair of homers on August 7 at New Britain anddrove in 5 runs on August 14 vs. NB. Split the season between A Kinston and AA Akron where he hit .258 (124-481) with 31 doubles, 22HR & 92 RBI in 123 games...Was 2nd among organizational hitters in HR and 3rd in RBI...Was a mid-season and post-season all-star selection in the Carolina League and after the season was tabbed as the 5th best overallprospect in the CL by Baseball America...Was named the 2nd best prospect in the Indians organization byBaseball Prospectus after the season...At the time of his promotion to Akron on August 8th he was 2nd in the Carolina League in hits (107), RBI (79),HR (18) and runs (59)...Ended the season tied for 4th in HR (18) and 3rd in slugging % (.492) despite notplaying there the final month of the season...HR'd in 3 straight games with 13RBI, April 21-23...Had 4 grandslams for Kinston and hit .325 (67-206) with runners on base and .310 (39-126) with RISP...Hit .330 in May...Had a multi-HR game for Akron on August 27...Hit .467 (14-30) in the Eastern League playoffs with 2 2B, 2RBIand 7 runs in 7 games w/an on-base % of .500 for the EL champs...Named the 2nd best prospect in the Indians organization entering 2010 according to Baseball America. Named the 6th best prospect in the organization by Baseball America prior to the season...Ranked 2ndin the NYPL in doubles (20), 5th in hits (80), total bases (121) and extra base hits (28) and was a NYPL all-star for Mahoning Valley. Around the Horn: Can outfield carry Bucs? April 19, 2019 Pittsburgh Pirates sent OF Lonnie Chisenhall on a rehab assignment to Indianapolis Indians. 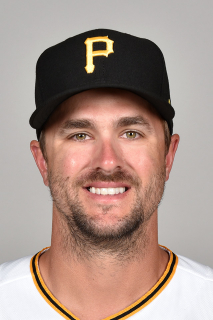 March 28, 2019 Pittsburgh Pirates placed OF Lonnie Chisenhall on the 10-day injured list retroactive to March 26, 2019. Right index finger fracture. November 27, 2018 Pittsburgh Pirates signed free agent OF Lonnie Chisenhall. October 29, 2018 RF Lonnie Chisenhall elected free agency. October 29, 2018 Cleveland Indians activated RF Lonnie Chisenhall from the 60-day disabled list. July 20, 2018 Cleveland Indians transferred RF Lonnie Chisenhall from the 10-day disabled list to the 60-day disabled list. Left calf strain. July 3, 2018 Cleveland Indians placed RF Lonnie Chisenhall on the 10-day disabled list. Left calf strain. June 5, 2018 Cleveland Indians activated RF Lonnie Chisenhall from the 10-day disabled list. May 30, 2018 Cleveland Indians sent OF Lonnie Chisenhall on a rehab assignment to Columbus Clippers. May 25, 2018 Cleveland Indians sent RF Lonnie Chisenhall on a rehab assignment to Akron RubberDucks. May 21, 2018 Cleveland Indians sent RF Lonnie Chisenhall on a rehab assignment to Columbus Clippers. April 8, 2018 Cleveland Indians placed RF Lonnie Chisenhall on the 10-day disabled list. Right calf strain. September 1, 2017 Cleveland Indians activated RF Lonnie Chisenhall from the 10-day disabled list. August 28, 2017 Cleveland Indians sent LF Lonnie Chisenhall on a rehab assignment to Columbus Clippers. August 27, 2017 Cleveland Indians sent OF Lonnie Chisenhall on a rehab assignment to Akron RubberDucks. August 15, 2017 Cleveland Indians sent OF Lonnie Chisenhall on a rehab assignment to Columbus Clippers. August 13, 2017 Cleveland Indians sent OF Lonnie Chisenhall on a rehab assignment to Akron RubberDucks. June 6, 2017 Cleveland Indians activated CF Lonnie Chisenhall from the 10-day disabled list. June 3, 2017 Cleveland Indians sent CF Lonnie Chisenhall on a rehab assignment to Akron RubberDucks. June 1, 2017 Cleveland Indians placed CF Lonnie Chisenhall on the 10-day disabled list. Concussion. May 25, 2017 Cleveland Indians placed CF Lonnie Chisenhall on the 7-day disabled list retroactive to May 23, 2017. Concussion. April 13, 2017 Cleveland Indians activated CF Lonnie Chisenhall from the 10-day disabled list. April 12, 2017 Cleveland Indians sent RF Lonnie Chisenhall on a rehab assignment to Akron RubberDucks. April 7, 2017 Cleveland Indians sent RF Lonnie Chisenhall on a rehab assignment to Columbus Clippers. April 2, 2017 Cleveland Indians placed RF Lonnie Chisenhall on the 10-day disabled list retroactive to March 30, 2017. Right shoulder sprain. May 17, 2016 Cleveland Indians activated RF Lonnie Chisenhall from the bereavement list. May 13, 2016 Cleveland Indians placed RF Lonnie Chisenhall on the bereavement list. April 20, 2016 Cleveland Indians activated RF Lonnie Chisenhall from the 15-day disabled list. April 14, 2016 Cleveland Indians sent OF Lonnie Chisenhall on a rehab assignment to Akron RubberDucks. April 7, 2016 Cleveland Indians sent RF Lonnie Chisenhall on a rehab assignment to Columbus Clippers. July 30, 2015 Cleveland Indians recalled RF Lonnie Chisenhall from Columbus Clippers. June 8, 2015 Cleveland Indians optioned 3B Lonnie Chisenhall to Columbus Clippers. April 13, 2014 Lonnie Chisenhall roster status changed by Cleveland Indians. April 10, 2014 Cleveland Indians placed 3B Lonnie Chisenhall on the paternity list. June 18, 2013 Cleveland Indians recalled 3B Lonnie Chisenhall from Columbus Clippers. May 13, 2013 Cleveland Indians optioned Lonnie Chisenhall to Columbus Clippers. September 9, 2012 Lonnie Chisenhall roster status changed by Cleveland Indians. September 5, 2012 Columbus Clippers sent 3B Lonnie Chisenhall on a rehab assignment to Akron Aeros. September 2, 2012 Lonnie Chisenhall assigned to Columbus Clippers. July 24, 2012 Cleveland Indians transferred 3B Lonnie Chisenhall from the 15-day disabled list to the 60-day disabled list. June 30, 2012 Lonnie Chisenhall roster status changed by Cleveland Indians. May 28, 2012 Cleveland Indians recalled 3B Lonnie Chisenhall from Columbus Clippers. May 19, 2012 Lonnie Chisenhall roster status changed by Columbus Clippers. April 29, 2012 Columbus Clippers placed 3B Lonnie Chisenhall on the 7-day disabled list. March 27, 2012 Cleveland Indians optioned 3B Lonnie Chisenhall to Columbus Clippers. June 27, 2011 Cleveland Indians selected the contract of Lonnie Chisenhall from Columbus Clippers. June 22, 2011 Lonnie Chisenhall roster status changed by Columbus Clippers. June 17, 2011 Columbus Clippers placed 3B Lonnie Chisenhall on the 7-day disabled list. Concussion. March 29, 2011 3B Lonnie Chisenhall assigned to Columbus Clippers from Akron Aeros. January 13, 2011 Cleveland Indians invited non-roster 3B Lonnie Chisenhall to spring training. May 28, 2010 Lonnie Chisenhall roster status changed by Akron Aeros. January 14, 2010 Cleveland Indians invited non-roster 3B Lonnie Chisenhall to spring training. August 8, 2009 3B Lonnie Chisenhall assigned to Akron Aeros from Kinston Indians.